Buenos Aires, Argentina. 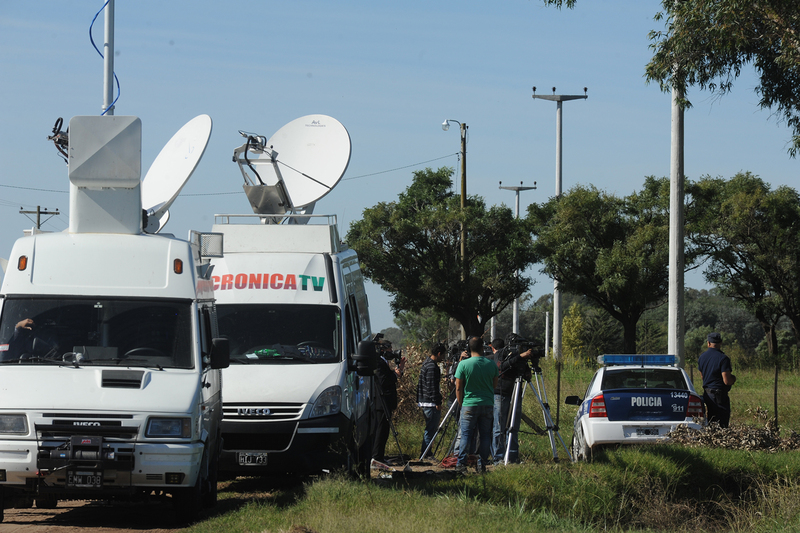 On August 21, 2015, a news story broke in Argentina that shocked the country and received wall-to-wall television coverage. Fernando Farré, a successful executive, had stabbed his wife and mother of his three children, Claudia Schaefer, to death at his weekend home in an exclusive gated community in Pilar, on the outskirts of Buenos Aires. The crime occurred during a meeting to settle the division of the assets of the couple, who were going through an acrimonious divorce. When Schaefer entered her closet to collect her belongings, Farré walked in behind her, locked the door, and proceeded to stab her 74 times with a kitchen knife. Lawyers for both parties and Farré’s own mother were at the house at the moment of the attack. Hearing her screams, they tried unsuccessfully to open the door. They then went outside and broke the room’s window in an attempt to stop the attack. But they were too late. In the days following the murder, which became known as the “Gated Community Femicide,” details of the couple’s life were revealed to the public. The 52-year-old Farré, who had worked with large companies such as Avon, Coty, and L’Oréal, often posted photos on Facebook of his glamorous vacations and celebrity friends. His 44-year-old wife had filed police reports just weeks before her death that Farré had abused her both verbally and physically in front of their children, who were just 9, 11, and 13 years old; they are now living with Schaefer’s sister. Photographs of Farré’s blood-stained face after he was thrown to the ground and handcuffed by police at the crime scene were leaked to the news media and helped the murder to become one of the most widely covered in years. The case became a topic of conversation among coworkers and friends. But it was just one of the many femicides—murders committed against women that have occurred and continue to take place in this South American country. In Argentina, a femicide occurs once every 30 hours, according to a study conducted by the Casa del Encuentro Civil Association, a nongovernmental organization that works to support women’s rights and combat gender-based violence. Whether they are killed by punches or kicks, stabbed, shot, slashed, or burned, the victims are women from all age groups and social classes. The perpetrators are generally former husbands, domestic partners, or boyfriends. 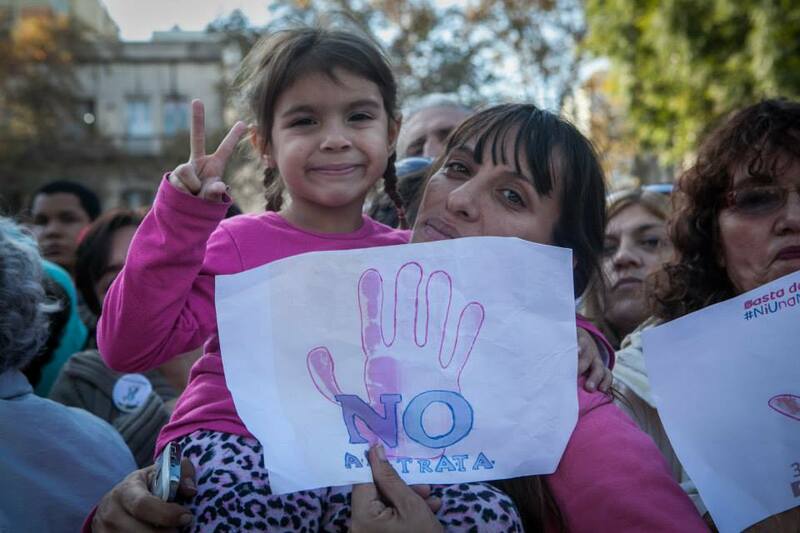 Mother and daughter hold up signs with the slogan “Ni Una Menos”, in the demonstration against femicide in Buenos Aires. Credit: Courtesy of Ni Una Menos. Some of the stories are particularly shocking because of the young age of the victims, such as 16-year-old Horacelia Génesis, who was stabbed and dismembered by her 34-year-old partner, the father of her 7-year-old daughter. Her remains were found in garbage bags scattered throughout various parts of Posadas, the capital of the Misiones province. Or the case of Melina Romero, who was murdered while celebrating her 17th birthday at a dance club. Her body was found on a riverbank in José León Suárez, in the Buenos Aires province. Other femicides draw attention because the victims had notified authorities, sometimes more than once, that they were in grave danger. This was the case for María Eugenia Lanzetti, a 44-year-old preschool teacher. Last April, she was stabbed to death in front of her students by her former husband in the San Francisco municipality in the province of Córdoba. Her attacker, Mauro Bongiovanni, had been issued a restraining order after multiple allegations of violent behavior, and he was forbidden from coming near the mother of his two children. But as in many other cases, the court order was unsuccessful in stopping the crime. In Argentina, there is no official updated registry that records the number of femicides in the country. * The failure to collect and analyze these statistics has become a focus of the debate, since having access to such data would reveal the magnitude of the problem. The lack of such data also indicates that the relevant government agencies are not fulfilling their responsibilities. “This amounts to non-compliance with law 26.485, passed in 2009, which makes compiling these statistics mandatory,” explains Fabiana Túñez, the director of Casa del Encuentro. Faced with this brutal reality, the people of Argentina are beginning to speak out. 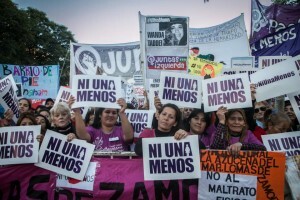 On June 3, 2015, 300,000 demonstrators convened in the Plaza del Congreso in the city of Buenos Aires, united by a common cause: “NiUnaMenos” (“Not one more”). The massive protest demanded an end to femicide and insisted on the adoption of policies to defend women victimized by gender-based violence. Protestors also gathered in 120 parks and streets across the country, waving flags and holding signs and photographs of the victims. From that moment, Argentina would treat the issue in an entirely different way. Media coverage. | Provincia de Buenos Aires Saladillo, April 16 2014 – Foto: Rolando Andrade Stracuzzi. Her message was the spark that ignited the protests. “From that point on, my other colleagues and I began talking to see how a protest that would bring our message to the streets would take shape,” Ojeda recalls. The hashtag #NiUnaMenos, an expression of the idea that we shouldn’t have to have even a single additional act of violence against women, had come up months earlier, during an event at the Museum of Books and Language to raise awareness of the issue. With about ten journalists leading calls for public demonstrations and famous actors expressing their support, the hashtag went viral on social networks. On the day of the march, society came together with a single voice to demand an end to femicides and respect for women’s rights. Attendance at the demonstration surpassed all expectations. “We thought we would bring in maybe 5,000 or 10,000 people. We never imagined this kind of crowd. We recently took a measurement from the photo of the event a day later. It was really moving,” Ojeda recalls. From the central stage, a document was read that contained numerous demands, such as the implementation of the National Plan established in Law 26.485 for the Comprehensive Protection of Women, the compilation of official statistics for violence against women and a femicide index, the inclusion of this issue in all educational curriculums, and guarantees of protection for victims of violence against women and for their access to the justice system, including free legal aid during the entire process. “We want all of our women to stay alive. All of them. #NiUnaMenos,” the text concluded. The Government wasted no time in responding. One day after the demonstration, the vice president of the Federal Supreme Court of Argentina, Elena Highton de Nolasco, called for a meeting of judicial authorities to collaborate in the creation of a Femicide Registry of the Argentina Justice (Registro de Femicidios de la Justicia argentina) “The many causes and complex nature of this problem, as well as jurisdiction issues inherent to the federal organization of our country, have not yet allowed this information to be organized. Therefore, until the registration system is complete, it is essential to begin by quantifying the greatest expression of violence against women: femicide. To accomplish this, the Supreme Court of the Nation has created an online system which allows individual jurisdictions to publish data for cases initiated during the year of 2014 on homicides of women (girls, adolescents and/or adults) perpetrated by men, which for reasons owing to their gender, have been classified as femicide or otherwise,” she indicated in a statement published by the Center for Judicial Information. Likewise, on June 29th, Argentina’s attorney general, Alejandra Gils Carbó, created the Special Prosecution Unit for Violence against Women (known by its Spanish initials, UFEM), and the national government formed the Registry, Systematization, and Tracking Unit for Femicides and homicides aggravated by gender, as part of the Secretariat of Human Rights at the Ministry of Justice, Security and Human Rights. On September 23, the Unified Registry of cases of Violence against Women, managed by the National Women’s Council in conjunction with the National Institute of Statistics and Census (known by its Spanish acronym, INDEC) released its initial findings. Every day, 55 women over the age of 13 report having been victims of gender-based violence. And 50,703 filed reports or asked for assistance from a state agency between January 2013 and July 2015. These are the initial results from the. “The demonstration was extremely useful for us since so many of the jurisdictions that hadn’t signed the agreements to be part of the registry finally agreed to sign up on June 4,” says Mariana Gras, president of the Council. There were also other repercussions in the provinces. For example, in the province of Buenos Aires, a law was passed that determined that couples who marry must receive training in gender-based violence, and that on June 3 every year (in commemoration of the day of the rally), all schools will dedicate time to educating students about the issue. Demonstrators in Buenos Aires, at the rally #Ni una menos. JUNE 3RD 2015 Credit: Courtesy of Ni Una Menos. On October 27, the National Women’s Council released its National Action Plan 2014-2016 for the Prevention, Assistance, and Eradication of Violence against Women, one of the demands of the historic march. The 112-page document “seeks to guarantee an equal, just, and inclusive life for all men and women,” and details the goals, actions, and advances within its principal areas of study, including government institutions and the legal framework; educational and work environments; health-related issues; the collection and systematization of data; prevention of violence efforts; victims’ access to the justice system; and assistance for victims of violence. Women in Argentina enjoy access to state-run support organizations, such as the Office of Domestic Violence, overseen by the Federal Supreme Court, which is comprised of a team of lawyers, psychologists, social workers, and doctors who provide year-round, 24-hour assistance. Over a 7-year period (from September 15, 2008 to September 15, 2015), 106,445 people contacted the office, the “only one of its kind in the world organized under the Supreme Court of the country,” as Judge Highton de Nolasco explains in an overview video for the organization. And, at national level, the telephone line 144 of the National Women’s Council answered 16,990 calls in 2014. Many other specialized organizations in the country’s provinces and municipalities provide help to victims of sexual violence. Numerous regions have implemented anti-panic buttons allowing women who have been attacked to activate them and alert security forces. In April 2009, Argentine Congress passed legislation to prevent, sanction, and eradicate violence against women. Photo: Rolando Andrade Stracuzzi. Argentina is certainly not an isolated case when it comes to the existence of femicide; gender-based violence persists in many countries. According to the Uns Progress of the World’s Women Report 2015-2016 report, more than one-third of women have been victims of physical or sexual violence. In addition, they represent roughly two-thirds of the victims of homicides committed within couples or families. Nevertheless, 60 percent of all women who suffer violent attacks do not file reports with the police or ask for help. Clearly, despite gains made during the last decades worldwide, there is still much work to be done. The same conclusion could be made about Argentina. In Túnez’s opinion, “there have been advances in legislation, but we still need to do a lot of work in terms of prevention and direct assistance to victims. Femicides can be avoided. At a fundamental level, we need to understand that gender-based violence is a question of human rights, and that crimes are committed for reasons that are essentially cultural. These cases involve an aggressive man who considers the woman to be his property, whom he wants to control and dominate. If he can’t get this outcome, he may resort to committing femicide.” To eliminate gender-based violence, there would have to be “changes to school curriculums, educating in equality, allowing victims access to the justice system with free sponsorship, and the support of specialized forces. Additionally, it’s very important to be able to detect the initial warning signs that later lead to physical violence: jealousy, humiliation, isolation,” Túñez states. Violence against women is shrouded in layers of complexity and requires a multi-pronged, comprehensive solution. It is a problem that touches on culture, law, the judicial process, psychology, and the economy, among many other factors. The analyses of specialists coincide on one central issue: the need for better education and increased awareness. As Túñez points out in reference to the murder of Claudia Schaefer, “This is a crime that could have been avoided. The victim’s lawyers, unaware of what gender-based violence was, called for a meeting with the aggressor and led the victim down a dead-end street. It was malpractice. They treated it like a typical divorce, based on the prejudices stemming from the fact that they were dealing with people who were well off,” she concludes. Femicides have always occurred, in Argentina as well as the rest of the world. The current debate centers on whether such crimes have increased in number or whether they have simply become more visible due to greater media coverage. 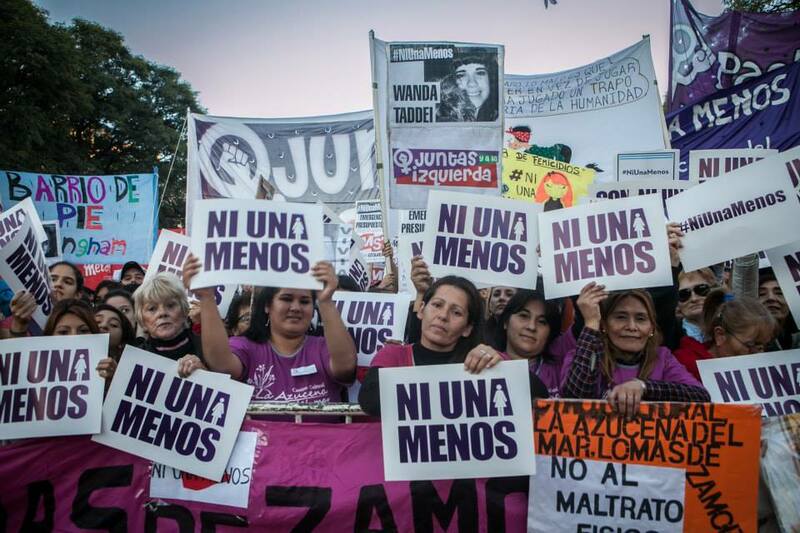 But one thing is certain: what once was largely seen as a private matter has become public, as the people of Argentina expressed during the #NiUnaMenos rally. And now that the issue is part of the political agenda, it remains to be seen not only whether the government will continue to put the necessary mechanisms in place to avoid more femicides, but also whether long sought-after cultural changes will occur that will finally stop gender-based violence once and for all. This article was written before the Argentine’s presidential elections took place on October 25th in which Mauricio Macri, the opposition candidate, was elected as president. Since then, several changes occurred. On November 25th, on the occasion of the International Day for the Elimination of Violence against Women, the Supreme Court presented the National Registry of Femicide of the Argentine Justice which is available online and is based on the information from all the judicial branches across the country. It is a comprehensive report, indicating that 225 femicides took place in 2014 and that 75% of the cases were committed by relatives of the victims. The Registry includes all women’s homicides cases (adolescents and/or adults) perpetrated by men for reasons associated with their gender, whether or not classified as femicide. On its part, Casa del Encuentro presented the previous day new updated figures: in the first 10 months of 2015, there have been 233 murders of women, who left 163 children without a mother. In addition, 113 crimes were committed at homes, which became the least safe place. Meanwhile, the future president Macri made a surprising decision by appointing Fabiana Tunisia, director of La Casa del Encuentro, as president of the National Council of Women. Now Tunisia, who for years claimed for the implementation of the National Plan for the Prevention, Assistance and Eradication of Violence against Women, will have the chance to put it into effect. In short, the June 3rd rally #NiUnaMenos, set the political agenda on this issue which is essential to reverse the violent reality experienced by so many women in Argentina.